processes make us a better company. Investing in customer relationships by going the extra mile builds the future. Beginning in 1984 Milkco started a new business model shipping in corrugated boxes to warehouse distributors. Corrugated shippers kept the milk colder and cleaner than the standard milk crate. This corrugated is totally recyclable and is made from partially recycled material. Store order pick was part of this change, creating short lead times of 24 to 36 hours. Store order picking began as a pick from paper system in 1984. This system was updated to barcode scanning to improve accuracy in 2000. Voice picking began in 2009 to drive efficiencies and improve lead times. By 2011, we were moving forward again with a custom Vertique installation integrating Milkco’s DMS computer system with Vertiques automated mechanical picking and palletizing order selection system. This collaboration resulted in a system with real time inventory control. 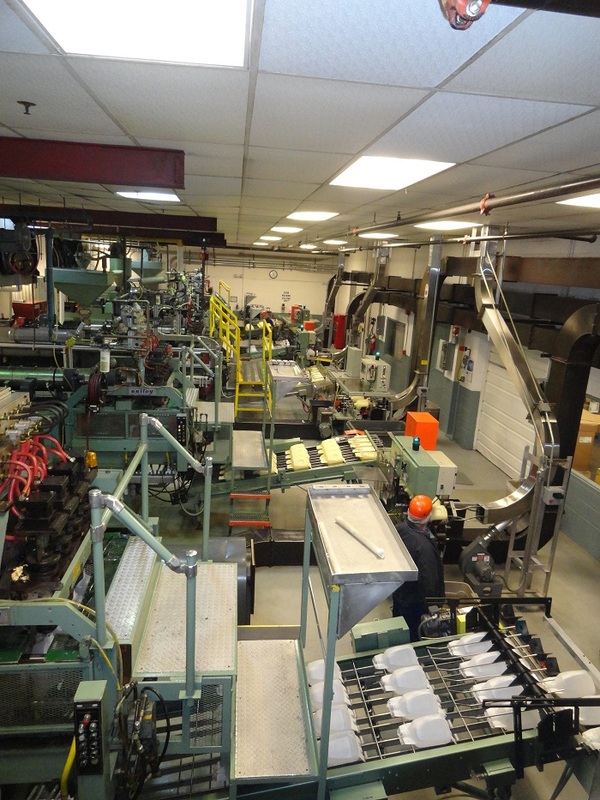 Milkco began blow molding in 1984 when they purchased two Uniloy Machines. In 1993 a new building was constructed to allow expansion for future growth. Between 1994 and 1996 we added two additional machines. Through trades and purchases additional machines and upgrades were implemented in the years that followed. We are not finished improving, just planning the next step. Currently Milkco uses 144,000 pounds of resin a week to manufacture gallon bottles. In 1997 Milkco began working with Gannett Fleming to develop a product recovery system. After consulting with the FDA for three years to make sure the product met all the criteria of the pasteurized milk ordinance this system went live in 2000. Gannet Fleming was awarded Patent US20010035198 A1 for the design of a product recovery system. Milkco’s own staff have for years made improvements and modifications to equipment. Beginning in 1995 the maintenance department manufactured the first Milkco Quick Change Case Packer. This innovation reduced changeover times from thirty minutes to five, resulting in greater efficiency. 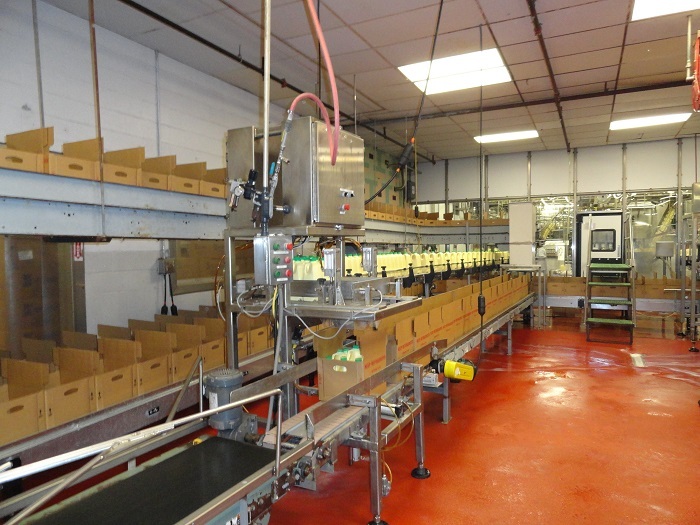 The next target was a continuous motion case sealer to allows faster production and reduced cost of maintenance. 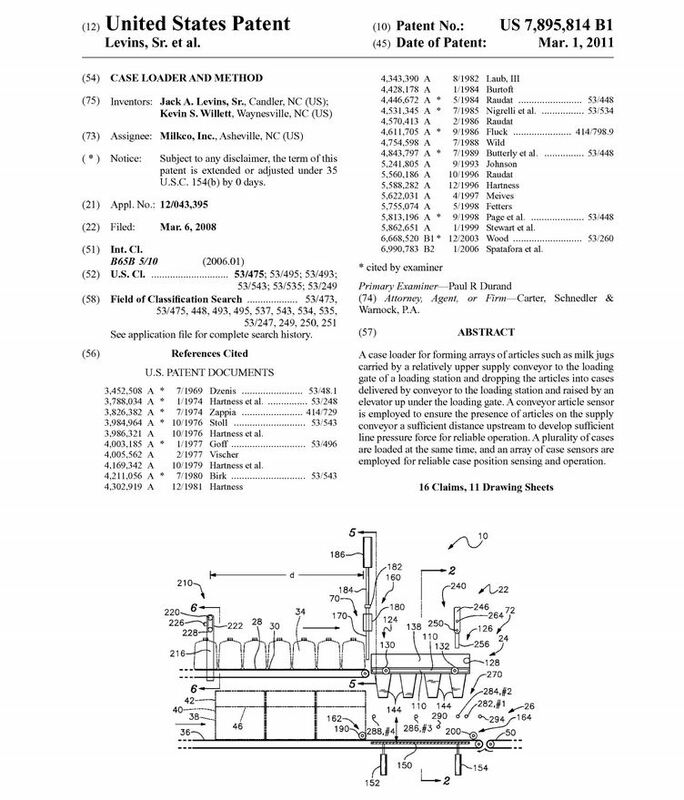 In 2011 Milkco was awarded Patent #7895814 for case loading and methods. In 2014 the staff designed and manufactured an improved prototype and it is making the patented model obsolete as we move forward. Any project that will have a positive environmental impact is given serious consideration. From the beginning Milkco was a company with a “Vision” that was not the industry norm. pounds of corrugated annually at our facility alone. system has significant impact on the waste stream at Milkco. pounds of CO2 greenhouse gas annually. resources entrusted to us. The future is sure to present many additional opportunities.